Definition: Employee Transfer is a process of horizontal movement of an employee, wherein there is a change in the job, without any revision in the remuneration and modification of responsibilities. It is a form of internal mobility, in which the employee is shifted from one job to another usually at a different location, department, or unit. Transfer can be temporary or permanent one, and it is initiated by any of the two, i.e. employer or employee. Sometimes, it also includes promotion, demotion or even no change in the status and responsibility. Some positions require distinctive skills, competency and expertise of the transferred employees. The transfer is also affected when there is a shortage of employees in one department of the organisation due to high demand, and there are surplus employees in another department. So, the workers are shifted from one department to another. It is also initiated when there are some clashes between the superior and subordinate or between two workers. To break the monotony of the work, employees are transferred, as the productivity of an employee decreases by doing the same job again and again. An employee may request to the human resource department, to transfer him to another location, due to health issues because of the climate is not suitable for his/her health. Female employees commonly request a transfer when they get married, and they have to live with their spouses. The transfer may be requested by the employee himself or by his immediate boss (superior) or by the manager of another department. Production Transfer: To prevent lay-off production transfer takes place, i.e. when there is a surplus of the workforce in the factory. Excess workers are laid off, except if they are transferred to another factory or plant, where there is a shortage of labour. Replacement Transfer: This form of transfer also helps in preventing lay-off of senior employees by replacing a junior employee. The organization opts this transfer when there is a continuous decrease in the operations, and the organization wants to retain long service employee. Versatility Transfer: To make the employees competent and versatile, these transfers are initiated. It is also called as job rotation which can be commonly seen in banks where employees working at clerical levels has to work at different profiles. 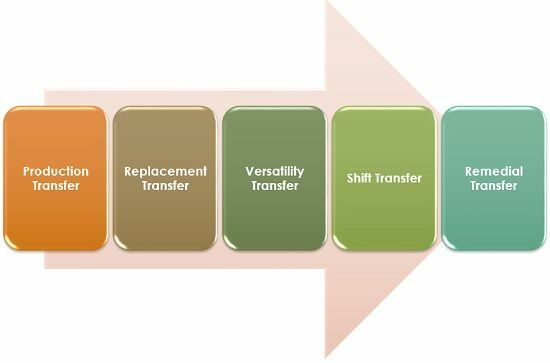 Shift Transfer: In general, industrial establishments operates on rotational shifts, and the workers usually request a transfer to the shift of their choice. Remedial Transfer: When the initial placement of an employee is faulty, or the worker is not comfortable with the superior or with the coworkers, or there are some health issues, then these transfers are affected as a remedy to the situation.As the transfer is requested by the employee himself, it is also called as a personal transfer. There are several benefits of transfers which includes improvement in skills, employee satisfaction, better employer-employee relations, the remedy to faulty placement etc. The transfer must be clearly, stated as temporary or permanent. Transfer criteria should be laid down clearly and strictly complied with. The interest of the organisation should be kept in mind while framing the transfer policies. The effect of transfer on the salary and other things of the transferred employee must be specified clearly. The frequency of transfer must be known to all the employees along with the minimum period of transfer. The performance of the employee must be evaluated before making the transfer, to a different job or department. There are some problems associated with the transfers such as employee may not like or fit the new location, or it may decrease productivity, or it may reduce their interest in the job, which leads to employee dissatisfaction.